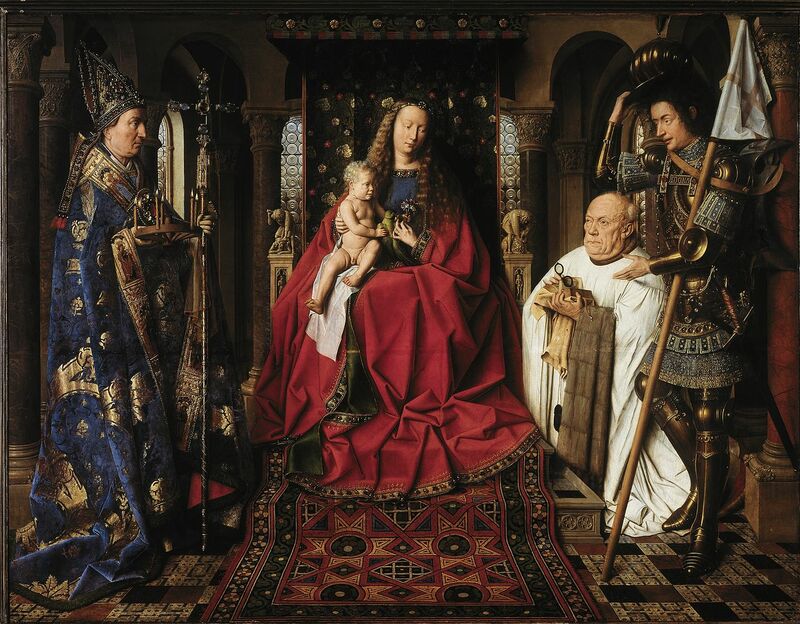 At the beginning of the 15th century, a new way of painting appeared in Flanders, of which Jan van Eyck was the figurehead. Although he didn’t invent oil painting as legend has it, his way of using it, however, was completely revolutionary as he didn’t only use it as a varnish, but also for binding the pigments, which would give a very bright appearance to his works. Added to this it is worth mentioning his attention to detail and the way he played with light, a new conception of landscape, a truly convincing visual use, and a strong sense of illusion that gave his paintings the feeling of being windows open to another world. The pictorial revolution influenced the whole of Europe. The Crown of Aragon was marked by the aesthetics of the north, above all thanks to the cultural policy of Alfonso the Magnanimous (King from 1416 to 1458), who introduced many Flemish works and artists in his territories. The numerous commercial exchanges and also the journeys of the artists and the movements of the works supposed a fundamental way of coming into contact with the Flemish culture, which would determine an important pictorial transformation. The Barcelona artistic scene would represent one of the most eloquent examples of these changes, above all through Lluís Dalmau, Jaume Huguet and also the Vergós family and Bartolomé Bermejo, of whom important works are conserved in the Museu Nacional d’Art de Catalunya. The altarpiece of the Virgin of the “Consellers” by Lluis Dalmau is probably the work that best illustrates this pictorial renovation. 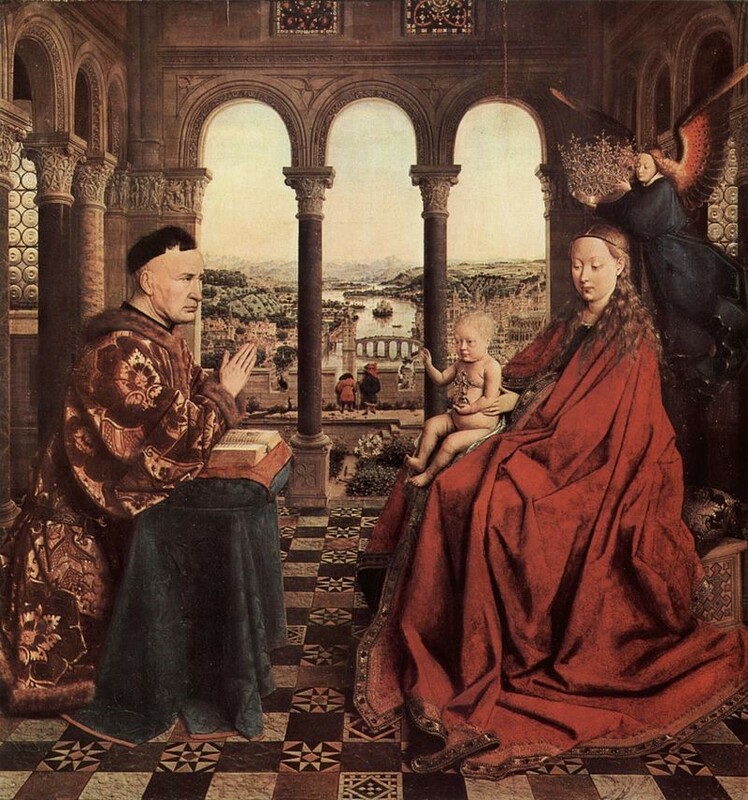 A copy of the style of Jan Van Eyck, this Mare de Déu (Virgin) is a direct reference to the Flemish Masters such as the Virgin and Child with canon Van der Paele (Groeningemuseum, Bruges) and the famous Altarpiece of Adoration of the mystic lamb by the Van Eyck brothers (Saint-Bavon cathedral, Ghent) which Dalmau was able to personally see during his trip to Flanders in 1430s. This is particularly noticeable in the representation of the Virgin and the musical angels, models copied from the works of the Master of Bruges. 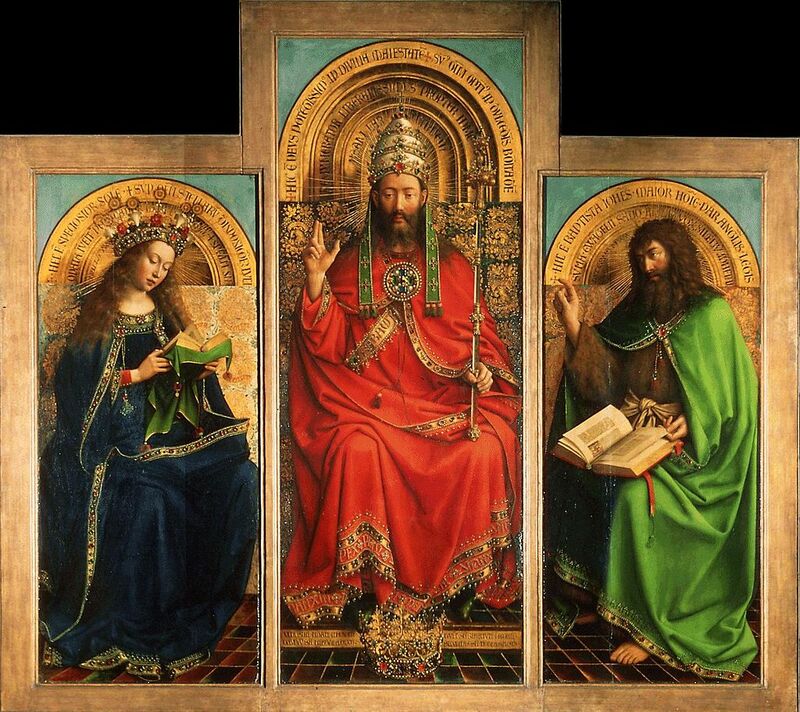 Loyal to the technique and way of Jan van Eyck, Dalmau painted this panel in oil, although during this period in Catalonia he painted above all in tempera. His virtuosity is demonstrated in an illusion that excels in the production of the first half of the Catalan 15th century, appreciable both in the reproduction of luxury materials (velvet clothes, jewelry, etc.) as well as in the green landscapes and the realistic portraits of the consellers. The work of Dalmau must have had an important influence on the diffusion of the Flemish way in the local artistic scene, of which it is worth highlighting the figure of Jaume Huguet, who was the most important painter from the second half of the 15th century in Catalonia. 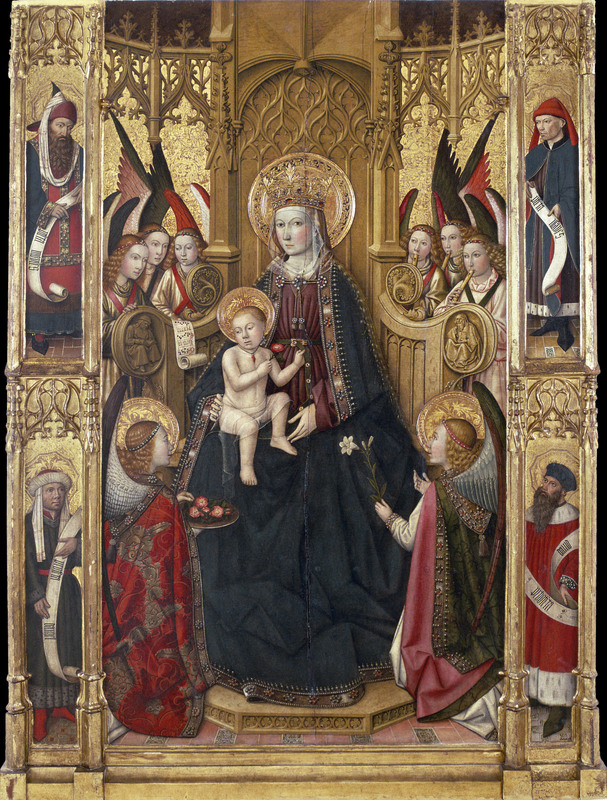 The confrontation with the Virgin of the Altarpiece of Vallmoll by Huguet, exhibited alongside the Madonna of Dalmau, is very significant. Although Huguet made his own interpretation of this way of painting, we can appreciate clear references to the first work evoked. We see the Virgin in majesty, seated on a Gothic throne, dressed in red with a blue mantle, and surrounded by musical angels. Along with this we should also focus on the attention paid by the painter on the representation of each detail: the fineness of the sculptures of the throne, the richness of the jewels and embroideries, and even the phylacteries with writings and scores that can be read. We can note, however, a fundamental difference between the two sizes. In Huguet’s work the background is not composed of an illusionist landscape, but rather a golden background, as in many Catalan works of that era. This imposition, the will of the promoters, did not prevent the painters from trying to integrate all the possible Flemish elements into their works. Thus, although they still show a completely unreal golden sky, we can see in the panels of the altarpieces of San Miguel and of San Agustín an attempt of the presentation of a landscape. 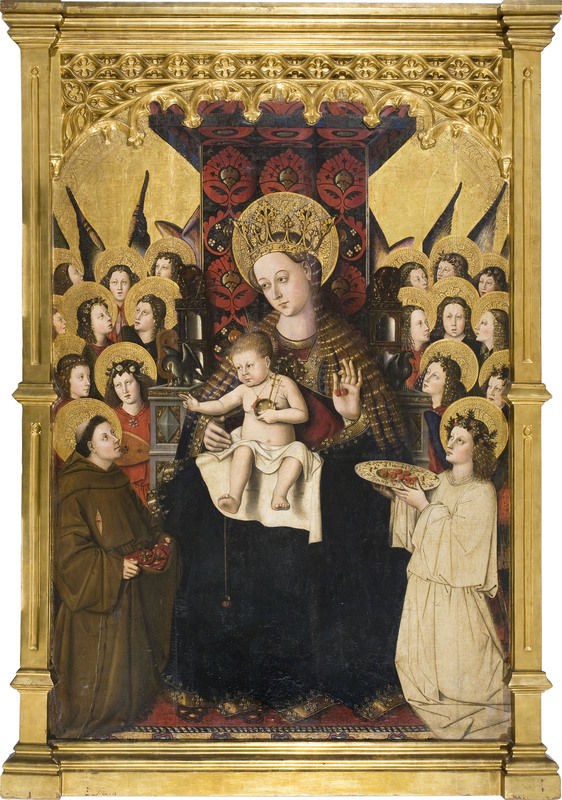 The works of Lluís Dalmau and Jaume Huguet, can also be compared with the panel of the Virgin of the Porciúncula, painted by the anonymous Valencian artist called the Master of the Porciúncula, presented in the rooms alongside those of Lluís Dalmau and Jaume Huguet. Although the workmanship may seem coarser, this Valencian panel highlights a strong connection with the “Eyckian” world. 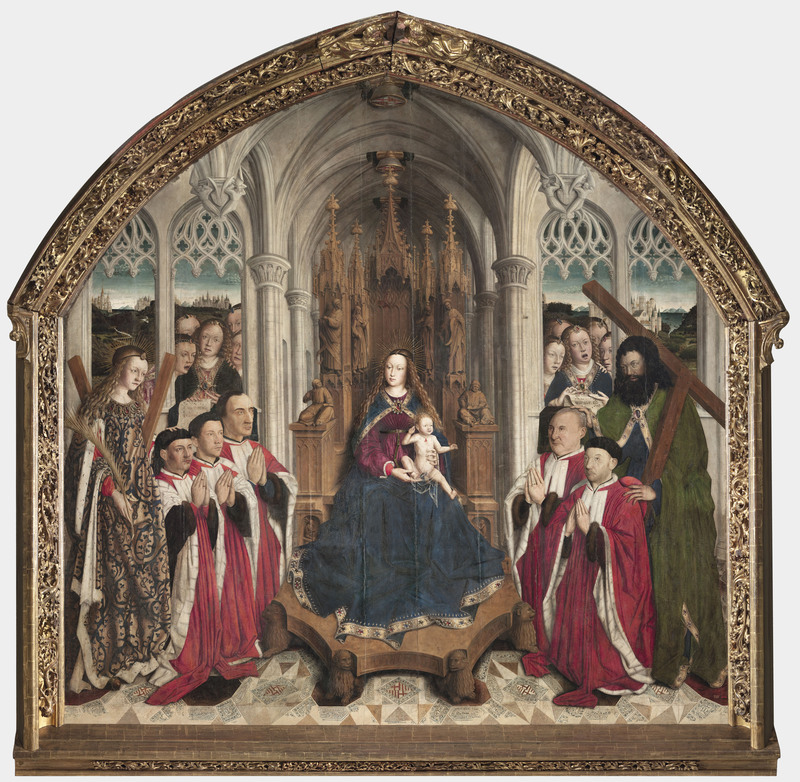 The attention to detail with a clearly illusionist objective, as seen in the wreaths of the angels and the rich jewels of the Virgin’s coat, is mixed with the local pictorial tradition, as in the case of Jaume Huguet. Furthermore, the artist seems to make direct references to Flemish painting, as in the gestures and attributes of the Baby Jesus, which recall the painting by Jan van Eyck, especially the Virgin of Chancellor Rolin (Musée du Louvre, Paris). It is also worth highlighting the use of the mixed technique, a combination of tempera and oil. Obviously, Lluís Dalmau and his trip to Flanders must have played an important role in the development of the iconographic vocabulary and of the Flemish technique on the local painters. The works of all these artists highlight the varied reception of Flemish painting in the Catalan territories, and the possibility of contemplating them together in the museum allows us to appreciate the similarities and invites us, at the same time, to distinguish their particularities.